When thinking of London, you think culture, theatre, Victorian buildings, and terrible weather. When thinking of New York, you think Skyscrapers, Starbucks, a big statue and a bigger bridge. Now, when it comes to Rio, you think sunshine, beach, outdoor activities, football, a selfie with Christ the Redeemer, great food, carnival and adventure. That’s why we went to Rio, I really wanted a selfie with Christ the Redeemer. Our trip actually started in Sao Paulo (I went with my mate Ron). 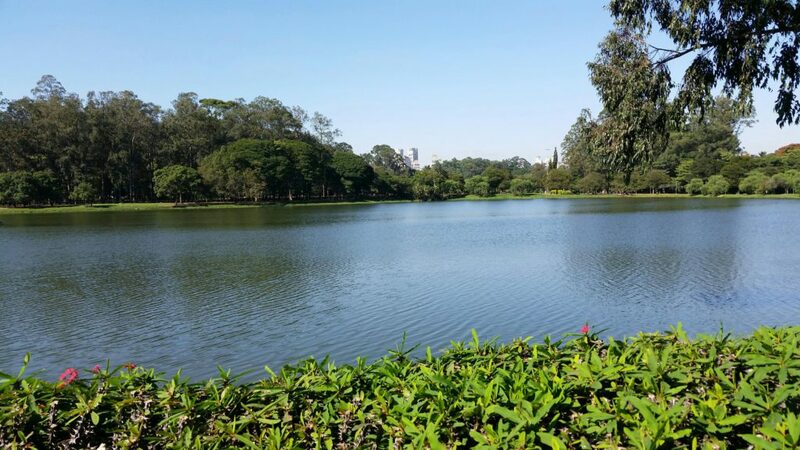 We wanted to stretch our legs straight after arriving at the hotel and so we looked for the nearest park – Ibirapuera park. This particular park turned out to be extremely lush with a large lake as well as a few monuments, I’m quite glad we made the journey even if we did get lost afterwards looking for food. Now, As this was only a stopover we hadn’t spent much time planning the trip and so we found ourselves wondering the streets and just absorbing our surroundings. We quickly discovered the giant undercover Municipal Market which is really worth a visit, it’s a maze of stores and restaurants. 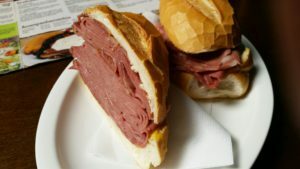 As I was starving I ordered a meaty sandwich known as a ‘Mortadella Sandwich’ which was just an insane amount of baloney between bread, it was basically a heart attack served between two buns. FOOD: Make sure that while you are in Brazil you try Coxinha, Pichana, Cocada, Brigadeiro’s, Farofa, Acai, and Feijoada. We then made our way to the Banespa Building as we had heard that you can go up to the observation deck for free! Unfortunately, it was closed so we had to make do with a photo of the building instead (I’m going to Brazil at the end of the year so I may get another chance). Next we made our way to the Theatro Municipal which is quite a stunning building with a really nice green park out the front. However, I was surprised to see kids no older than 12 blatantly selling drugs in the middle of the day. Of course I know of the corruption, drug and violence in Brazil, but seeing it is a whole new story and bit of a reality check. We ended the day by visiting the Sao Paulo Cathedral which didn’t fail to leave an impression, especially with the amount of homeless people and beggars that set up camp around the building. It quickly became apparent that the divide between the poor and the rich was huge. We ended the evening on a highlight, a self guided tour of the street art in Vila Madalena which lasted about an hour and a half. It’s well worth adding a visit to this area, but I recommend doing it during the day not the evening (our photos didn’t turn out great…but it was still a good walk). Afterwards we found a local restaurant that had live music, it was definitely the best part of Sao Paulo for me. Unfortunately I can’t remember the name of the place, if I do I’ll update this post. However after only 2 days we’d already had enough of Sao Paulo, we struggled to get a feel and find our ‘groove’ with this city and were looking forward to making our way to Rio. In December 2016 I’ll be visiting again and this time staying with locals, maybe that’ll make the difference, I’ll let you know. We were both really looking forward to Rio and I’ll tell you now that we loved it. The first thing I noticed between Rio and Sao Paulo were the people. The locals in Rio were friendlier and always had big smiles, probably because of their beaches. Rio had much more of a ‘community’ feel than Sao Paulo. Having said that the divide between rich and poor was still blatant. The esplanade along Ipanema and Copacabana was clean and modern, yet one block behind that and things completely transformed. It’s worth spending a little bit of extra cash to get a hotel on the beach front, we got a pretty good offer including breakfast at the Windsor Atlantica and the views from the top were stunning. I also wanted to do a tour of the Favelas, however, Ron made a valid point – ‘seeing how people live in poverty shouldn’t be an attraction’ – I agreed so we didn’t go. I also wanted to go hang gliding but this turned out to be pricier than I expected. As I was most looking forward to getting a selfie with Christ the Redeemer, we left this to the end, the great finale! As our hotel was right on the beach front our first day was spent swimming, relaxing, and walking along the beach’s stopping at every vendor to either buy a Caipirinha or a coconut to drink. A Caipirinha is a blend of lime, crushed ice, sugar and cachaça – a local spirit made of sugar cane which if drunk straight is comparable to petrol. I have concluded that it’s probably a distant relative of moonshine. However, Caipirinha’s are amazing! atmosphere. There is such a variety of people enjoying the outdoors and you’ll find some stunning works of sand art. I also really enjoyed watching Footvolley (football meets volleyball) which is played all along Ipanema, quite a skilful sport and I can understand why they love it. I’m going to put this out there, I much preferred Ipanema to Copacabana as there weren’t as many tourists (at the time) and it had a nicer atmosphere. However, there are two things I want to warn you about; firstly, don’t go to the beaches at night, secondly, be careful of buying food from vendors as you don’t know how long the food has been in the sun… stick to alcohol. Visiting a market while in Rio is not to be missed. Try local foods, haggle for gifts, and simply enjoy the buzz and atmosphere. It’s really worth it and let’s be honest, Brazilians know exactly what ingredients to use to create a market with great food and a fun atmosphere! We figured a trip to Rio isn’t complete without some form of a party. 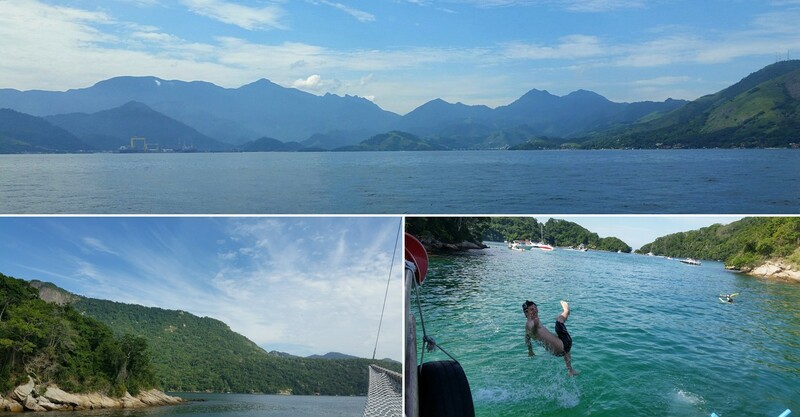 The challenge we had was that our only night free was followed by a 7am start to go on the Angra dos Reis Day Trip and Schooner Cruise. Our plan was to head out at 11pm, be back by 2am and hopefully be feeling fine for our day trip. This time round things didn’t go quite as planned. We took a cab and did a stop off at Escadaria Selarón, also known as the ‘Selaron Steps’. It’s not just the stairs that’s worth a visit, but the surrounding area as well. We quickly realised we should have done a bit more research on Santa Teresa and Flamengo. We continued to the club and found out that it was still closed, the cab driver said ‘well yeah it doesn’t open until midnight’. Not to waste an hour we went off to explore the area which turned out to be a Favela, not really somewhere you want to be at night. But, we saw some children playing on the streets so we figured how bad can it be? While walking up a windy staircase we suddenly heard a man in a suit running behind us and at that same moment all the kids scattered off, not a good sign. A moment later the man came running back holding a TV, we figured it was time to go back to the club. I probably don’t need to say this but try to avoid wandering through Favelas at night. We went to the club and WOW, what an experience. It was a massive club split into multiple large halls with several levels. My favourite part was actually an outdoor bar that was built against a cliff face, it reminded me of ruin bars in Budapest. We had an amazing night, the atmosphere was great and the people were super friendly. 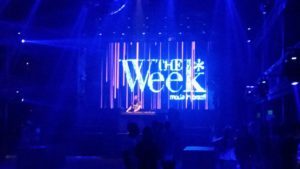 So, if you’re not in Rio during carnival, go for a night out instead, they know how to party and there are plenty of great clubs to choose from. Needless to say we didn’t get home until about 4am, but we had big smiles on our faces. I was really really looking forward to this, so much so that I was even willing to give up a day in Rio to be stuck on a coach and then boat with a load of tourists. I will mention at this point that the weather for our last 2 days was really starting to turn sour and we were a tad hung over. There’s nothing like a rocking boat while hung over – the views were worth it though. There’s something entertaining and mildly funny about going on a day trip with lots of tourists. I’ve always enjoyed people watching (not in a stalker way) and a tour like this provides a pinnacle for people watching. There’s nothing like putting a load of people from a huge variety of cultures into a confined space for a day. 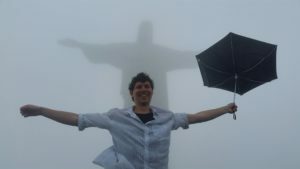 The weather had really turned for the worse, but I was optimistic and determined to get my selfie with Christ the Redeemer. So we headed over to the Corcovado train with a good feeling that by the time we get to the top the weather will have cleared and there will be no tourists. We got to the top and I got my selfie. There were very few tourists and I was probably the only one who was amused by the situation. We then made our way to the Botanical garden, annoyingly the weather had cleared and we got great photos of Christ the Redeemer from the ground. I love botanical gardens and two of my favourite ones are Singapore’s and Rio’s. We spent about 2 hours just walking around, I’ll let the photos speak for themselves. Also, we grabbed lunch there at a quint café, it was really worth it and I highly recommend a visit. We ended our trip with another tour, this time of Tijuca, also known as the lungs of Rio. An amazing rainforest that has some great vantage points of Rio (just to give us a taste of what could have seen from Christ the Redeemer). I was a bit disappointed by this tour as we didn’t get to do much hiking and mostly stayed on the road, I suggest either go for a full day trip with hiking, or hire a car/grab a cab and go their yourself. Our trip had come to an end and neither one of us wanted to leave, we saw the main sites, we got a taste for Rio but we both felt that there was more to be explored and experienced. Another day perhaps. I would have liked to have spent more time exploring other areas like Leblon, Flamengo and Santa Teresa. We mostly used cabs (airport, botanical garden, Corcovado train)….on one occasion we used a bus and it was fairly straight forward and cheap. Always look for a day trip to get out of a city and see some of its outskirts. Short and sweet advice. I hope you enjoyed reading this blog, if you have any other tips or recommendations about this amazing city feel free to use the comments below or the forum to start a conversation. I always like hearing what others have to say :). If you think others would like this blog, I would really appreciate it if you shared it on your social media sites. There’s some buttons further down that make sharing nice and easy.